Tool Review - TS-Aligner Jr.
Well, let's cut right to the chase. This is a great adjustment tool! I found the fit and finish of the tool to be outstanding. The provided owner's manual is very good and detailed. It is also written in plain English (not much technical jargon) so a country boy like me can understand it. The tool was very easy to assemble. The manual started with unpacking, describing the parts and telling what they were and how to assemble them. After the assembly it gave a brief theory of operation that explained a little about dial indicators and how to use them. This is a useful part of the manual for anyone who has not used a dial indicator very much (like me). 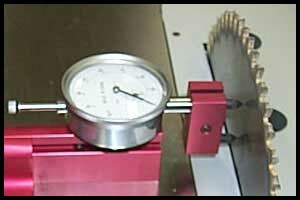 The next part was about the calibration on the tool itself. The first paragraph said " We carefully calibrate your TS-Aligner Jr. at the factory so there should be no need to calibrate your unit for quite some time." Well being raised in Missouri I thought, "Show Me" so I ran it through the calibration steps. That was a total waste of time as it was dead on accurate. Again the steps were very easy to follow. On to the tablesaw. I have always bragged to a few friends (Unisaw owners) that my Powermatic 66 was dead on accurate right out of the box. A few of them had to make several adjustments before use. I checked mine with the method shown to us at one of our Guild meetings, using an adjustable try square, and thought it was good. Well, I apologize to all whom I ridiculed! The flatness of the table and the arbor checked out fine. The rest of it was all out. The miter slots to the blade, the blade to the table, and the fence to the blade were all off from .010 to .088. The worst was the fence to the blade being .088 out at the rear of the blade. The angle adjustment was also off amounting to about 1/3 degree. Add up four corners and that ain't good! After adjusting the saw with the aligner the blade doesn't "sing" as loud and it doesn't throw as much sawdust into the air. I cut a couple of boards and box jointed them together, I do a lot of boxes this way. I couldn't really tell a difference in the fit of the wood after the adjustments but I know the saw was cutting better just by the sound. I then checked my drill press and jointer. There are not as many things to test. And the tests are not as detailed as with the tablesaw. I turn a lot of pens and drilling the blanks is a fairly precise operation. My drill always seemed to want to drift to one side. Making the hole a little slanted through the 2 to 2 * inch pen blank. I checked the squareness of the table to the bit with a machinist square and thought it was good. So I just wrote it off to the grain in the exotic woods. When I checked it with the Aligner I found it to be .048 out. I adjusted the table and drilled some blanks. I won't say it was a great deal improved but it did seem to be better. When drilling down through end grain the bit is going to drift some. I do feel better just knowing everything is adjusted as well as possible. I checked the blades in my jointer and found them to be in good adjustment. The Bandsaw also checked out OK. Again all the steps in the manual were very easy to follow. Oh Yea! Did I mention they also have pictures showing a lot of the steps? What more could you want. I think I have completed enough tests to say that I would highly recommend this tool to everyone. I spent about five hours with it altogether, but once you get the hang of it, it's fairly simple to use. I think anyone could tune every tool in the shop in a couple of hours. I've heard a lot of "experienced woodworkers" say, "working with wood, a few thousands off don't matter". Well, they may be right. But for a hundred bucks we get a cool new tool and the peace of mind knowing all is well in our private little world, the wood shop. Now I think that's worth it. I would like to thank Mr.. Ed Bennett of Custom Woodworking Tools, the WWA, Chuck, and Jim for allowing me the privilege of reviewing and owning this fine tool. to see everything concerning the TS-Aligner, Jr. or any of its accessories. Hartville Tool - TS-Aligner Jr.
Eagle America Inc - TS-AlignerJr. Garrett Wade Co - TS-Aligner and TS-Aligner Jr.